We have some BIG Community news! We've been working tirelessly for months on bringing you an entirely new online community experience. 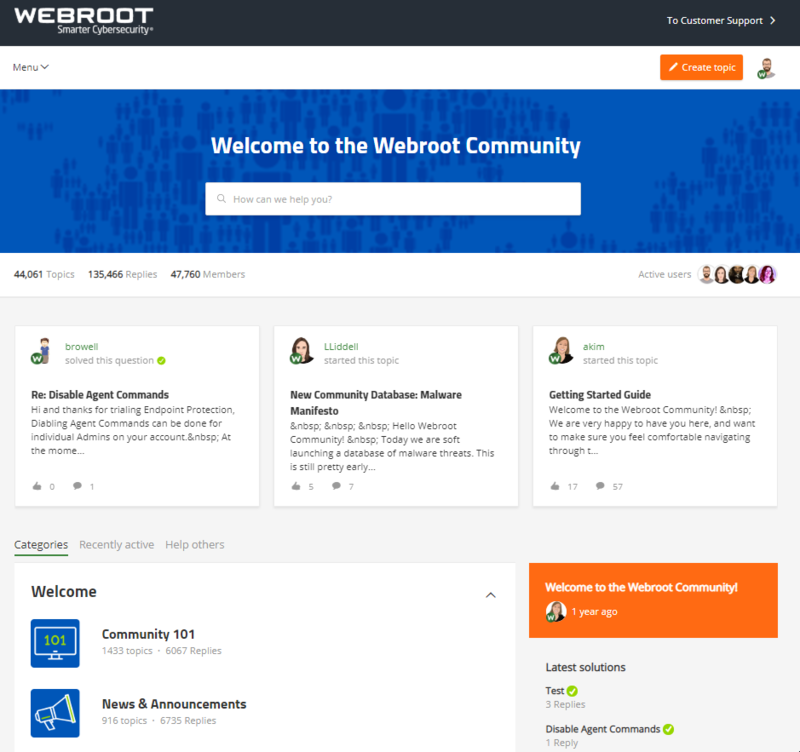 This means the new Webroot Community will get a brand-new design, site speed upgrades, functionality, and so much more. Follow this thread as we’ll update you with more as soon as we can. For now, check out a sneak peek of the new homepage, what do you think? Can't wait for everyone to see it. What do you think of the new homepage so far? "Other's can only strive to achieve what comes naturally to Webroot!" I can't wait to see what else you have up your sleeve for the future. Thanks everyone! We're really looking forward to launching it and letting you have access so you can experience it for yourself. Apprecaite the positive feedback so far! Sounds good folks and something i have complained about before. Navigating a forum can be a critial thing for any website but when it comes to finding a solution or posting a question for support it needs to be easy to find, easy to navigate to both mum and dad operators or SysAdmins and general community. The next thing i have asked for is executing updates that dont rely on using the %TMP% or any part of a users profile as everyone should have all exe files and script engine files blocked from executing on these locations for malware prevention. Maybe when installing as a local admin for the first time, create a hashed cached file which contains local admin rights/credentials and then update from the C:ProgramDataWRData location using the credentials file as like a token for rights elevation on a system to install the updates, or deploy this file from the cloud/console after entering the login details .localadmin:passwordhere encrypted with HDD ID and Base64? as each PC would be different and spreading aroudn anetwork harder as local admin rights across networked pc's does bugger all unless they gain kernel level access 3. Or maybe there is a policy you can create on the console to execute this instead of GPO's and application whitelisting. A console based approach would be better as you could choose the locations based on system variable or physical path and or even junction point. For home users, maybe leverage what Defender is doing with its randsomeware preventrion on folders. All in all, we look forward to seeign the new forum. Looks great. No new password to remeber. Thanks for the heads up. I have no idea what was just said here. Anxiously awaiting the new Community!! Oh boy. New. Shiny. Will it even have that new car smell? Bring it on, always ready for a new experience. So fresh and so clean. Can't wait to have everyone take the new community for a spin. I have a concern with Webroot. The reason why Windows Version 1809 was not updating, only getting to 81% until it stalled...FOREVER! The reason for this was an infection. However, Webroot never saw this and I had to take it to Best Buy to get the problem fixed. Also, prior to taking my computer to Best Buy I had 2 Geek Squad agents to attempt the problem and after scaning my computer with my Webroot, twice, they still did not find any infections. Would like some takes on the above. I have exactly the same issue on a system I was bringing up to the latest level of Windows 10...stalling always at 81% no matter what I tried...until some research I was doing led me to a suggestion that the Windows Updater was stalling due to an AV being installed. So what I did is I uninstalled WRSA completely...retried the update and...presto, it went through with no hiccups whatsoever...so I very much doubt that the issue with your system has anything to do with malware being present...more likely all that the so called 'experts' at Best Buy did was to uninstall WRSA, run Windows Update & then give it back to you. After all I very much doubt that at the 81% mark of the Windows Update process it runs an anti malware scan, and if so then what does it run? Just all seems a bit implausible in my humble opinion and experience of many Windows Updates, etc. Did Best Buy inform you with what your system was purportedly infected with? I suspect not...I have heard that they rarely do. So, in my book the source of the issue very much lies with Microsoft. Having said that, and for a balanced view, no AM/AV is 100% successful 100% all of the time in preventing malware getting onto a system. If such a beast did exist we would all be using it, eh? So it is possible that something did get past WRSA, but would it really have stopped the update process...for the reasons stated previously, I very much doubt that would have affected anything. But as I said, these are my views, based on my experiences. and provided as one of many possible takes. My rig updated to windows october in a breeze and never stalled, imo WSA is not the culprit, a 20 years experience in soft and hardware with MS makes me think the problem was with W10 struggling unsuccessfully with unforeseen conflicting hardware and/or 3rd party situations. Whenever I encountered difficulties updating MS I uninstalled the AV and 3rd party firewall and successfully retried thereafter. WSA is not the culprit and MS + WSA cannot foresee what the users rigs are made of. just to mention my son's rig stalled at 81 % too during several hours before it successfully finished... the difference is that it's sporting Eset... my rig, with wsa updated in 20 minutes (optical fiber) without a hiccup. Thank you very much for the reply about this issue. I finally took my computer to Best Buy and they did fix the problem with version 1809 not finishing the update. It appears to have been an infection. I'm wondering if you had the same infection? Seems nice and simple. Can we expect a dark theme? Thanks for everything you are doing for the community. Looks good. Looking forward to trying it out. Soon, those who watch reruns of Seinfeld will be called, as racist! Is anyone having a problem getting to their Outlook email? I can get to Outlook but when I click to open an email, whether from my 'inbox' or spam, it quickly jumps to another MSN page. So, what's up with that?